Astrologers tell me I was born with the moon in Pisces, which is supposed to explain my fondness for water and the fragile state of my mental health. Well, who knows? Anyway, perhaps that’s why I fell in love many years ago with the idea of a trip on a houseboat — not that I’m an intrepid sailor; I don’t know port from starboard, and though I can stay afloat in calm water, I can’t swim for nuts. When it came my turn to organise the biennial get-together of a few old Ag Scientists and spouses (the operative word here is old; if you want to be politically correct elderly), I wondered what I would do. I live in a broom cupboard three hundred metres from the Pacific Ocean. Eight of us couldn’t stay there. What to do? Then I remembered my houseboat dream. l made enquiries. T’was possble: The rental for 4 days and nights was a little over $200 per person. This amount can be a lot or a little, depending on the state of your finances. The first night one of my girlfriends and I spent a lot of time wandering the boat while everyone else slept. We were trying to uncover the source of various odd noises. Were we dragging the anchor? What was that strange banging noise we could hear upstairs? Had we dropped the anchor too short and the nose of the boat was slowly being pulled under the water as the tide rose? (My particular favourite.) Etc. etc. Eventually exhaustion overcame us and we slept. To put it in buddhist terms, we “wore the experience out, and so were able to relinquish it.” Whatever. We had a bit of an accident on our first morning out. In attempting to get from the houseboat to the dinghy, one of our number fell into the river. But we fished him out and dried him off and gave him a cup of tea. Soon he was as good as new. More adventures befell us. With me as navigator and our Fallen in the Water (FITW) skipper, we managed to run aground later on that day. Well, of course, what were you expecting? I have zero skills as a nav. In my defence I have to say that when we reached the point where we had to choose one waterway or the other, the green bouys I was following appeared equally relevant — or irrelevant, depending on how you were looking at it. It was just bad luck that decided me to tell our intrepid skipper to go right (starboard?) instead of left (port)? “We need to rock the boat from side to side,” our FITW skipper told us. So we rushed to the upper deck and ran en masse from one side of the boat to the other while he revved the engine below. We were lucky: We were able tto reverse off the sandbank without having to submit to the shame of being towed off, or whatever it is they do under those circumstances. We managed to get into and out of the dinghy without further mishaps. 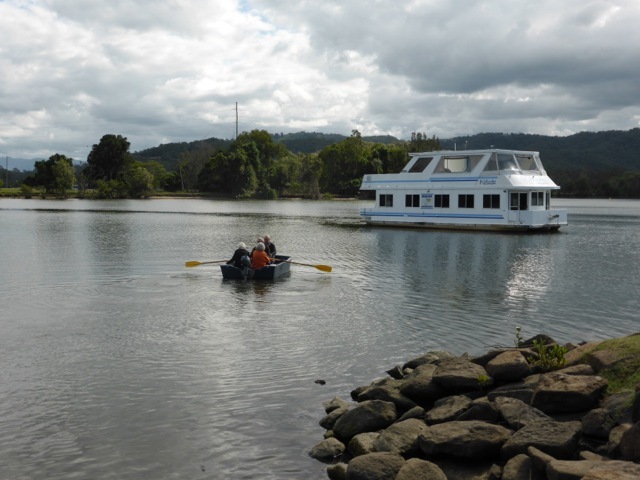 Here we’re returning from lunch at the Tumbulgum Pub; I’m the one in the orange pullover, clinging white-knuckled to the gunwale. Note to those in the Northern Rivers: The food at the pub was OK, but if you want ambience and nice food, skip the pub and go the the little Birdwing Cafe down the road. With a little help from our friends, we got to the Tweed River Art Gallery to see the new installation: a recreation of some of the rooms in recently-deceased artist Margaret Olley’s terrace house in Sydney. 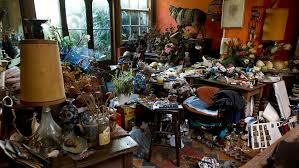 Olley was famous for her house, which was a mix of objets d’art, paintings and clutter. It was a good trip. The weather held fine, the Tweed lived up to expectations — it’s a beautiful river and there was very little traffic on it while we were there. Evenings as the boat swung at anchor, the stars seemed to wheel slowly across the night sky, and the moon slipped in and out of view in the windows of the room where I was sleeping. 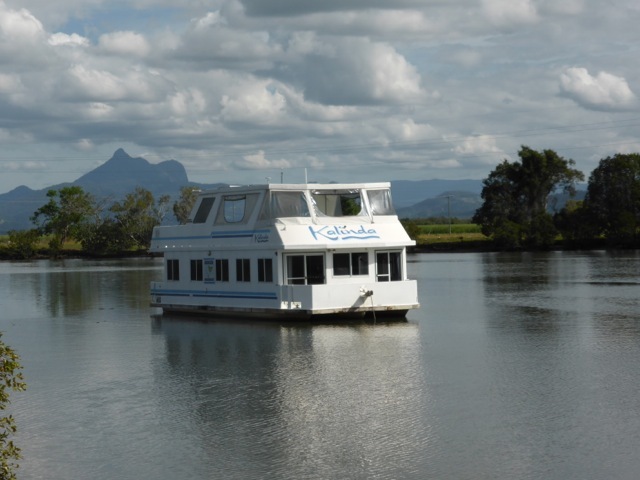 If you’ve never had a trip on a houseboat, think about trying it sometime. It’s different. Well, know I know what you were doing while you were gone. The artist’s house is a mix? Looks more like the aftereffects of a cyclone. I know what you mean. But Barry Humphreys (Dame Edna Everage) claims she had a kind of weird, assembly-line thing going, and would walk though the chaos, cigarette in one hand, adding a dash of paint to whatever WIP she passed. There were paintings cunningly concealed somewhere in there.